Born just north of Pittsburgh, Pennsylvania, on November 2, 1932, John was the firstborn of John and Ernestine Ritenbaugh. Four and a half years later, a brother, Paul, was added to the family. John had a normal childhood growing up in rural western Pennsylvania. His father and mother remained married until his father's death during the Days of Unleavened Bread in 1974. His widowed mother died at age 93 in early 2001. After graduating from high school, John worked for a year at a number of entry level jobs until he secured a job at Pittsburgh's major utility firm. This led to his meeting the girl of his dreams, Evelyn Roberts. A little over a year later, they married, and as of February 2005, they have been married 53 years. John's salary at the utility firm was too small to support a family, so through a brother-in-law's connections, he found a job with the U.S. Steel Corporation in Homestead, Pennsylvania, where he worked for 16 years as a journeyman welder. During the 1950s, Evelyn gave birth to Virginia, Carol (1953-2000), Susan, Diane, and Alison. Richard came in 1966 and Sharon, in 1970. John and Evelyn now also have twenty grandchildren and nineteen great-grandchildren. Five of their surviving children, eighteen grandchildren, and sixteen great-grandchildren live in either the Charlotte, North Carolina, or Atlanta, Georgia, areas. A daughter and two grandchildren live in northwest Indiana. John and Evelyn first heard Herbert W. Armstrong on the radio in January 1959. Intrigued, they sent for literature immediately. They voraciously read everything they could get their hands on, and by June, they requested baptism. In July, they were invited to attend services in Pittsburgh, and on September 19, they were both baptized. In April 1965, John was ordained a deacon, and the following year, also in April, he was ordained as a local church elder. In spring of 1968, the Ritenbaughs were invited to attend Ambassador College for one year on a special program for local church elders, an offer they accepted. Following the 1968-69 school year, John was assigned as a full-time elder to what was then the Long Beach and Anaheim, California, congregations. In September 1969, John was ordained a preaching elder and given the responsibility of pastoring those congregations. At the Feast of Tabernacles in 1982, John was ordained to the rank of pastor. During their ministry, John and Evelyn have pastored churches in California, North and South Carolina, Georgia, Indiana, and Illinois. A ministerial transfer in July 1975 sent the Ritenbaughs to Columbia, South Carolina, where John also pastored congregations in Walterboro, South Carolina, and after a few years, Augusta, Georgia. He also began Bible Studies in both Florence, South Carolina, and Savannah, Georgia, which later became congregations with full-time local pastors. In early 1983, they moved to the Hammond, Indiana, area, where he pastored the Chicago Southeast (Hammond) church and later the congregation in Park Forest, Illinois, the Chicago West (Tinley Park) church, and the Michigan City, Indiana, congregation. He also conducted regular Bible Studies in St. Joseph, Michigan. In 1986, they returned full circuit to pastor again in Southern California (Glendale, North Hollywood, and later Pasadena Auditorium AM), only to be returned to the South in 1991, when they were transferred to Charlotte, North Carolina. In January 1992, John and Evelyn resigned from the Worldwide Church of God (WCG) because they disagreed with the doctrinal changes and direction of the church. The Church of the Great God (CGG) began shortly thereafter when a small number of brethren, also in disagreement with WCG, asked the Ritenbaughs to pastor them. Since then, they have hardly had time to look back! 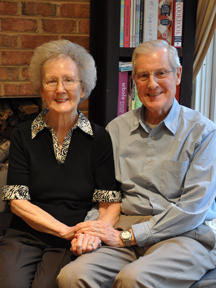 John and Evelyn reside in Charlotte, North Carolina, where he works in the church office preparing sermons, writing articles, answering questions, and overseeing the major business affairs of the CGG. Once each month, John travels to congregations scattered throughout the U.S. and Canada, and a few times a year he visits the brethren in international areas. John says, "I look forward to the time when the church will once again be unified. But until that time, it is my hope that I might be able to make use of more than fifty years of experience in the ministry and serve you in this capacity."